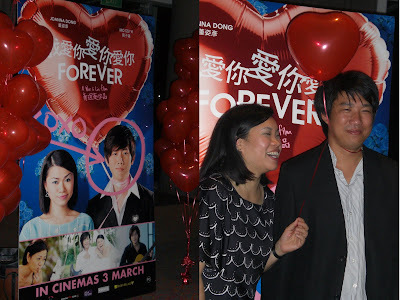 "Didn't arrange seatings for my wedding,now have to for my film"
Here are some snapshots from the fun and exciting gala premiere of 'Forever'. Me (Darren) and Li Lin at the premiere! Li Lin looking Proud in her best! The one lady behind "the best" of Li Lin, Jo Soh(also the owner of design label Hansel) . Does this look like a gala premiere or a wedding reception to you? The crew at the registration buried in the unenviable work of registration for the event. "Theatre's happiest couple" giving their best wishes to "Forever" Show is starting...On the biggest Screen in Vivo~! As the crowd went off, the workers were quick to get to work.... Singapore is sometimes too efficient! starring Li Lin as "Joey" and Charles as "Gin"
Perhaps the story will be equally interesting~! In Comparison to end everything off~! Here's me making a late night signing off~!